The NCR SelfServ 81 is an interior, freestanding, branch-specific, multi-function ATM. 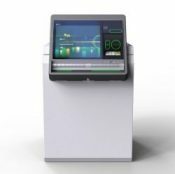 Transform – NCR Interactive Assisted Teller enabled. Connect consumers to the efficient delivery of convenient live teller services from the ATM across extended hours and locations. Attract – Infinity Display: supports multi-touch. 15″ or 19″ LCD screen. Integrated customized branding opportunities for financial institutions.